I had a nice fall session scheduled with this mom and two boys. Normally, in October, we deal with some cool temps, maybe even some rain. Well, not this day. On this particular day, it was HOT. Mom had chosen some really cute outfits, complete with button-ups, sweaters, and cords…not knowing it would be a whopping 90 degrees. OOPS! We did grab some shots of the boys in their dressier outfits, but we ALSO let them cool off in their pretty sweet t-shirts, too. Win-win! Of course, I made mom get in a few frames, too. Moms…you will NEVER regret having pics with your kids!!! Sydney is a quiet beauty who fit perfectly with the natural surroundings we found for her session. It was a great day and she rocked the location! She also epitomizes the “Real Senior” and I love that about her! Check out some of the images from our time together! This is also the last chance to apply for the KRP Senior Team for the class of 2020! Contact me ASAP for info!! Hello, lovelies! It’s that time of year again…the annual KRP Senior Team search! I am accepting applications for those graduating in 2020 from ALL local high schools. If you’re interested in applying to represent KRP, please message me and I’ll send you the information. I am SO excited about this year! AHHH! I had the delight of working with this wonderful young lady just one year after doing her sister’s senior session. I can’t tell you just how great it was to work with both girls and their mom. They are SUCH awesome people! We chanced the weather and it ended up working out perfectly. A little bit moody, a lot amazing. I am in LOVE with the results!! I honestly don’t know where to begin when it comes to the AHHHMAZING ladies that were part of the KRP Senior Team this year. Seriously. The world would be a better place if we had more of their kindness, intelligence, and spirit. Each of these women is beautiful, and not just in the physical sense. They are BEAUTIFUL people on the inside. It was absolutely my pleasure to work with them this year. I like to ask each of the girls a few questions after our time together. First up, we have Ashley! Check out what she had to say! If you've chosen the school or university you're planning to attend, and been accepted, please share! Stay tuned for interviews with the other KRP Real Seniors!! Chase knew, for certain, that he wanted his senior pictures done at the rink, where he spends much of his time. His mom was so sweet and SO happy to be getting some shots of her handsome guy! While he was most focused on the indoor shots, we also managed to convince him to step outside for a few, as well. After all, it was a gorgeous day! Thanks, Chase for putting up with us that day ;-) It was fun!! I had the chance to spend an evening this past summer doing a senior session with Tucker. Not only is he a hard working, well-spoken young man, but he’s also a pretty fantastic Cross Country athlete. At the time of the session my son was on the fence about joining the XC team, himself, and after talking to Tucker and his mom about it, I knew I could convince him to give it a “go”. My son ended up joining the team and would tell me about how one of the really nice high school boys would help the middle school students and encourage them. I don’t know how many of you spend time with seniors, but let me tell you…THAT is awesome. He made such a good impression on P and I am so grateful for that. In addition to being kind and athletic, he also knew how to work the camera. He pretty much rocked this session (so did Jackson!)! Mr. N made his debut into the world right after mom, Blair, squeezed in her maternity session. Thanks for waiting, N! Once mom, dad, and baby were all settled in at home, I spent some time with them, doing a lifestyle newborn session. His little sleeping self was SO precious. Not to mention…THAT HAIR!!!! I couldn’t even. Check out these images from this sweet session! When my good friend Blair told us she was going to have a baby, there was no doubt in my mind that she was going to be a stunning mama-to-be. She took such great care of that growing baby, as well as herself. You’d find her in the gym right up until the week she delivered! Around 39 weeks, she mentioned maybe we should do a maternity session, so we got right to it! Little did we know, she’d give birth to an incredible little boy just 3 days later!!! Isn’t she amazing?! Stay tuned for the newborn session, as well! So, I suppose it would be obvious that I am WAY behind in blogging if I tell you that this maternity announcement has now turned into a beautiful baby girl who is nearly a month old?! Nevertheless, check out this ADORABLE announcement that was all planned out by the gorgeous mama! I loved her vision and these two were a blast to work with. Congrats and much love to this happy family of THREE!!! On the coldest day of the year (or maybe ever), I was thinking about a session I did on the HOTTEST day of the year! Libby, a Meadville senior, braved some major heat (in her jeans and long sleeves!) to get some shots with her horse, Moose. We found a couple shaded areas so it wouldn’t be quite so overwhelming, and they both did great. I had so much fun with these two!! As a football player, Ethan knew that scheduling a session during the fall would be a bit difficult, so he opted for a winter snow session. He was a total trooper about the cold and I LOVE the results! The S family is seriously awesome. I have known them for about 13 years and had the pleasure of capturing their family pictures since 2008. Watching them grow is pretty amazing. Each year is as unique and special as their relationship. I LOVE these people right here. It’s always such a great experience when you can watch a couple grow. I did an engagement session for these two beautiful humans a few years ago, and also had the pleasure of doing their maternity pictures! Let me tell you…these. two. are. FUN!! We had such a blast at both sessions. They don’t live around here, but I am anxious to meet the little girl they’ve welcomed into this world (YES, I am SUPER behind in blogging!!). I’ll quit rambling now and get to the good stuff. Here you have it…Allie + Bryan (+baby!)! I love any excuse to dress up. Halloween is no exception. In honor of today, I thought I’d post a throwback from last year. 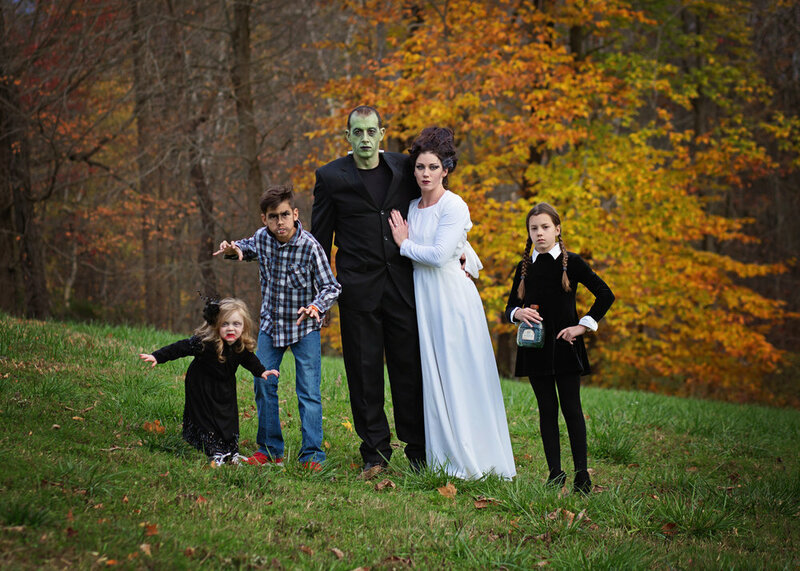 We decided to go as “the classics”…a vampire, a werewolf, Frankenstein, bride of Frankenstein, and Wednesday Addams. To say we have fun with this would be an understatement. I’m excited to share this year’s costumes tonight. Stay tuned! It's that time of year...FALL MINI SESSIONS! I am offering limited fall mini sessions, and they are booking QUICK! Spots are first come, first serve. If you are interested, please message me. These sessions will be taking place at Davenport Fruit Farm Cidery and Winery. I will also be announcing a different date later. I have had some people message me, asking about an option that does NOT include cards...you MAY opt for prints in lieu of cards! Feel free to message me for more details. I can’t WAIT for these sessions! They are going to be amazing!! These three kiddos were SO much fun to work with. They each had their own ideas for the session and I loved it! Mom was going to sit this one out, but the kids and I convinced her to get in the frame. Moms…GET IN THE PICTURE!! They’re only little for a short time. You will NEVER regret having those memories. Even if it’s just a shot or two…DO IT!! Fall can provide a gorgeous backdrop for photography, and this family session was no exception. The A’s were so much fun! I loved being able to watch the boys play, and getting to know mom and dad. We had an absolutely perfect day, too! Here is a glimpse into our time together! Thank you, A family, for choosing me to capture you! I have had the opportunity to photograph this brave, adventurous young lady since she was just nine months old. I can't begin to tell you how amazing it is to watch these little ones grow up. The time is so fleeting and they change SO much from year to year...being able to capture these moments is priceless.